Mil-Spec nylon webbing with brass swivel and your choice of carabiner. Two colors to choose from – Black or OD Green. 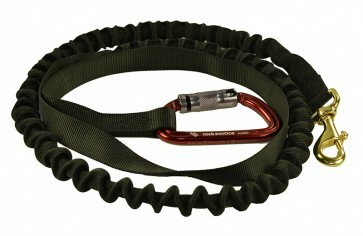 The Bungee Back Tie is a training tool for handlers and K9s. The Back Tie Strap allows the trainer to secure the Back Tie on any poll, post or even tree from as small as 2” up to 12” in diameter. 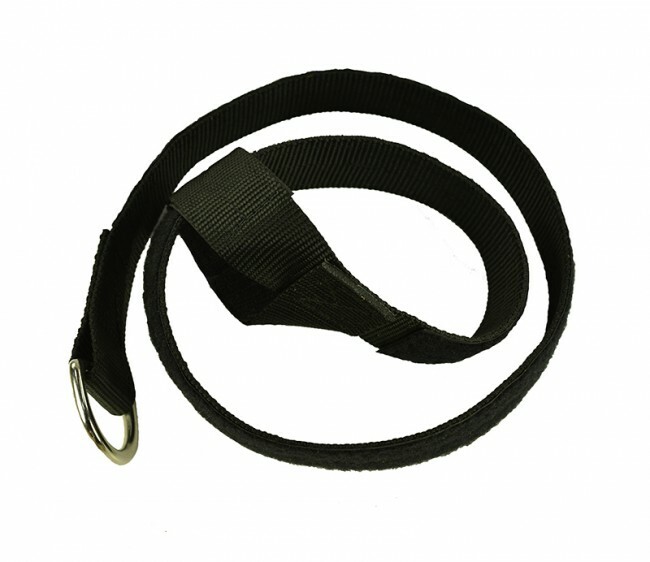 The Back Tie is designed to help the trainer with bite work or agitation training. The Back Tie is 6’ in length and expands to 8’ to provide give during training and reduces stress on the K9’s neck and body. 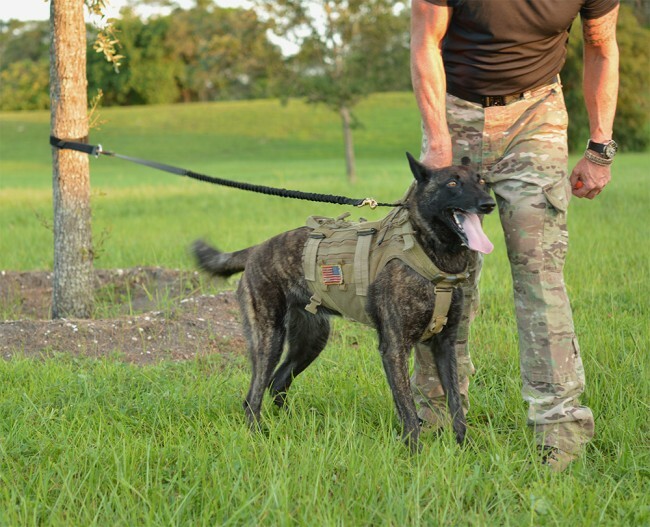 The bungee cord that is incorporated in with the Tactical back Tie provides enough "give" as to not place a strain on the K9's neck or torso area during training. Using the Back Tie: The back-tie set up is important because it allows the handler many freedoms in working the K9. Ultimately, it allows both the handler and the decoy to work with the K9 knowing how much freedom the K9 has - or how far out the K9 can deploy. The decoy can conduct bite work with the K9. Depending on the exercise, the handler and the decoy can working on partial or full bites. Because the handler and the decoy know exactly how far the k9 can deploy, they can agitate the K9 by entering the deployment area and force the K9 miss and hit (partial and full bites) the decoy. This is a great training tool and a must have in your tool kit! 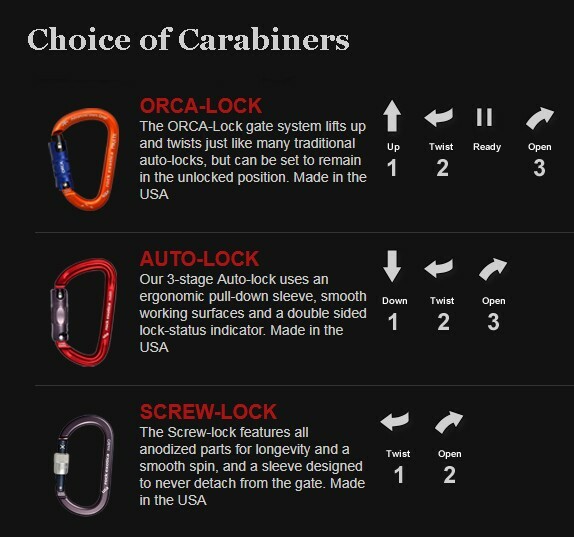 Orca-Lock - The ORCA-Lock gate system lifts up and twists just like many traditional auto-locks, but can be set to remain in the unlocked position. Made in the USA. Auto-Lock - The 3-stage Auto-lock uses an ergonomic pull-down sleeve, smooth working surfaces and a double sided lock-status indicator. Made in the USA. Screw-Lock - The Screw-lock features all anodized parts for longevity and a smooth spin, and a sleeve designed to never detach from the gate. Made in the USA.